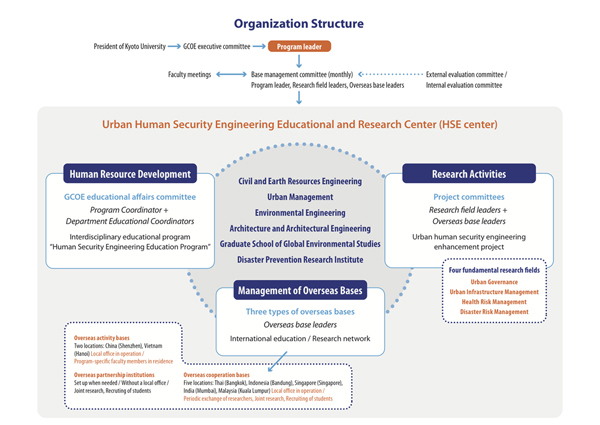 "Urban Human Security Engineering Education and Research Center" in Kyoto (Katsura Campus) serves the hub for all activity and cooperation at overseas bases. Also, the center is as the hub for the graduate schools in Kyoto University associated with human security engineering, i.e. Graduate School of Engineering (Environmental Engineering, Civil and Earth Resources Engineering, Urban Management, and Architecture and Architectural Engineering), Graduate School of Global Environmental Studies, Disaster Prevention Research Institute. The network of overseas bases will be expanded for closer international education and research activities.